August 22, 2012 was a red letter day for selected farmers who received incentives for planting bananas in their own backyards or farm lands. Where in the world would you find farmers who are paid for planting their own bananas; in their own lands; and all proceeds or income resulting thereto are all theirs? 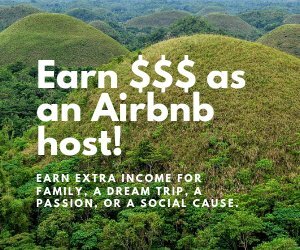 Yet, this is being done in the Municipality of Talibon, in the Province of Bohol, Philippines. Under the “Bisag Saging Basta Loving Project” of the Municipal Mayor, Restituto B. Auxtero, these farmers were given incentives to encourage them to PLANT….and PLANT….and PLANT BANANAS; so that all idle lands will be made productive; and in the long run, uplift the living conditions, eradicate poverty and to hopefully improve the nutritional status of these farmers and their families. This project was implemented last June 2011 and the first pay-out was released during the 115th Birth Anniversary of the late President Carlos P. Garcia on November 4, 2011. The 2nd pay-out was released at the Treasurer’s Office of the Municipality of Talibon last August 22, 2012 and a total of P255, 680.00 was distributed to a total of 288 farmers after a brief program at Talibon’s Multi-Purpose Center. The program commenced a wee bit late at 10:15 A.M. with Ms. Ponciana Cruda, the Municipal Agriculturist, giving the Welcome Address. Kagawad Batiting Auza, the Barangay Captains, the Municipal Nutritionist and Kalahi Officials and Staff, graced the affair aside from the Municipal Mayor and his documentary staff. After the guests and farmers were warmly welcomed, called to give a short message was Kagawad Vicente P. Auza, Chairman of Agriculture. He encouraged the farmers to avail of this additional income by planting more bananas in their lands for that was a rare opportunity which they can never find anywhere else; where farmers were being paid for their own banana plants! Then the Mayor took over the rostrum. He expounded on the “Bisag Saging Basta Loving Project” which he envisioned would help the farmers financially and hopefully eradicate poverty – his main aim. He believes on the “bottom-up strategy” in attaining progress and so targets all his projects on this scheme – working directly with the farmers, fishermen, and other low level work force. To this effect, the Mayor also released 100 paddle boats to fishermen last November 4, 2011 and is in the process of making another batch of paddle boats to be distributed this year. This is under his “Asenso sa Baroto Project”. In addition, he also established the “Patubig sa Barangay, Kahimsog sa Panimalay Project” wherein he gave water pump assemblies to groups of families who requested for them. He has released almost a hundred units to the different barangays under his jurisdiction. On top of these projects, and maybe the most laudable, he has entered into a Memorandum of Agreement with Gawad Kalinga for the construction of houses for the underprivileged constituents of Talibon. The recipients have been identified and the project is now being implemented. Among the 288 farmers present at the Cultural Center, called to the stage were two (2) farmers who planted the most no. 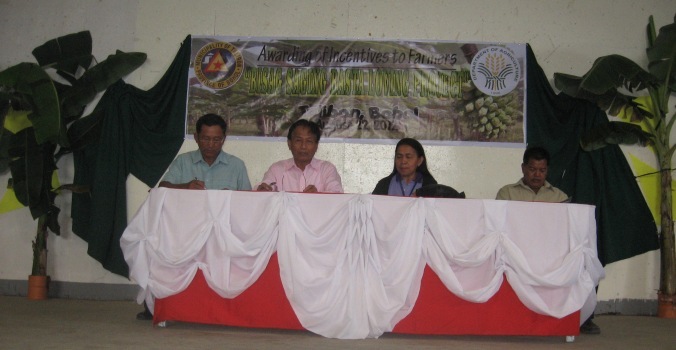 of banana plants and thus were the recipients of the highest cash incentives from LGU-Talibon. 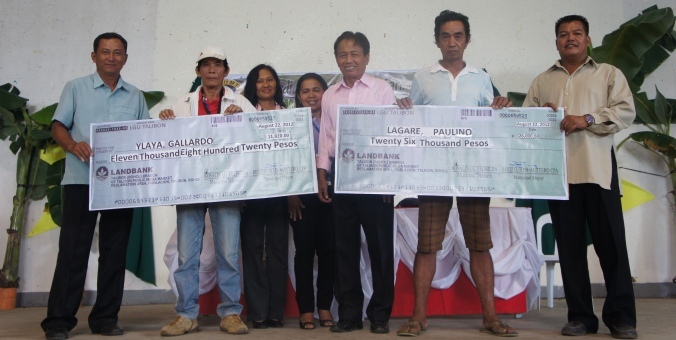 The highest awardees were Mr. Paulino Lagare of Barangay Magsaysay, receiving a total amount of P26,000.00 and Mr. Gallardo Ylaya of Barangay Zamora, receiving the amount of P11,820.00. They were presented with “giant” checks for posterity. 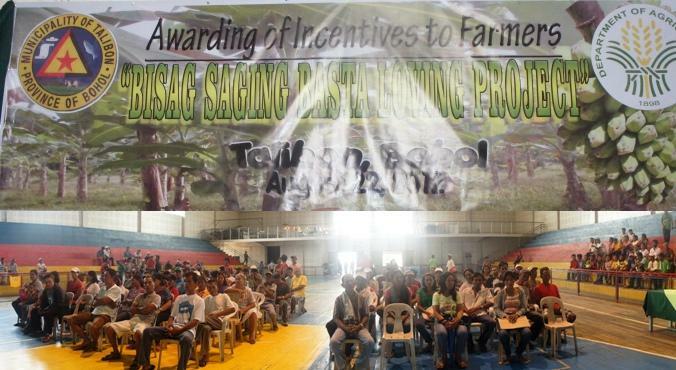 The farmers then were told to go to the Municipality of Talibon, specifically to the Treasury Office to claim their incentives after the Closing Remarks of the Executive Assistant to the Mayor, Mr. Apolinario Artiaga. Thus, after a short stint at the Multi-Purpose Center, the people dispersed and excitedly marched back to the Treasury Office for their incentives.